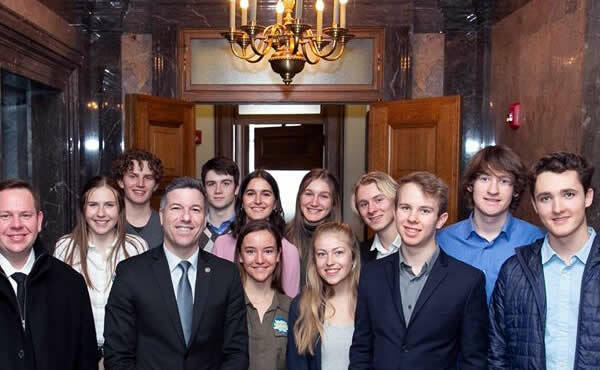 Supported by Methow Valley Citizens Council, MVSD Student Interns and Alumni Take Action on Climate Change :: Methow Valley Schools • Every Student Shines! Displaying the attributes and attitudes commonly associated with “action-oriented” citizenship, several MVSD student interns and alumni have been deeply engaged in the topic of climate change. Supported by the Methow Valley Citizens Council, they have been actively involved in a variety of community-based initiatives and more recently, legislative advocacy efforts involving our representatives in Olympia. In addition to their recent advocacy work in Olympia, they would like to invite each of you to learn more about climate change by attending a free screening of the critically acclaimed National Geographic film Paris to Pittsburgh on Tuesday, April 16th at Liberty Bell Jr./Sr. High School’s Auditorium.